Madagascar is an island located off the eastern coast of southern Africa in the Indian Ocean. 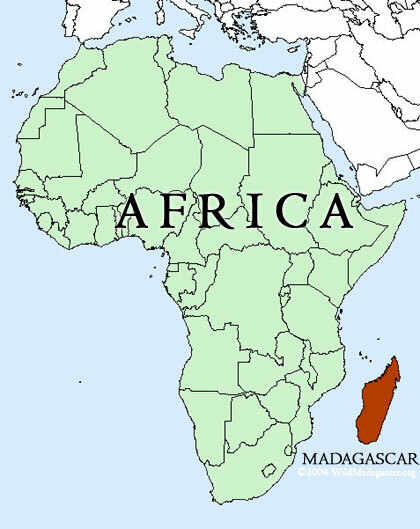 As the world's fourth largest island, Madagascar is a little larger than France but slightly smaller than Texas. Because of its remoteness, Madagascar was not settled by humans until around 2.000 years ago. The Malagasy -- the name for the people of the island -- are descended from Indonesians who made their way across the Indian Ocean. Arabs and Africans arrived later and made important contributions to the unique cultural practices found on the island. A little larger than California, Madagascar is the world's fourth largest island after Greenland, New Guinea, and Borneo. With its location in the western Indian Ocean, Madagascar is about as far away from the west coast of the United States as one can get. Flying to Antananarivo, the capital of Madagascar, from San Francisco covers about 11,000 miles or 17,700 km and takes a minimum of 23 hours of flight time. Madagascar can be divided into five geographical regions: the east coast, the Tsaratanana Massif in the north, the central highlands, the west coast, and the southwest. The central highlands run the length of the island and range from 2,600 to 5,800 feet (800 to 1,800 meters) in altitude. The Tsaratanana Massif region at the north end of the island has the highest mountain on the island. Madagascar is often called the "Great Red Island" because of its red soils, which are generally poor for agriculture. Madagascar also has some interesting limestone formations in the west and north. Known as tsingy, these formations result from years of rainfall causing the limestone base to erode. The east coast is the wettest part of the country and thus home to the island's rainforests. This area is also hit periodically by devastating tropical storms and cyclones. The central highlands are considerably cooler and drier, and are the location of much of Madagascar's agriculture, especially rice. The west coast is home to dry deciduous forests. Deciduous trees lose all their leaves during the 6- to 8-month dry season. When rains return, these forests erupt in a sea of bright green leaves. The southwest of Madagascar has the island's driest climate. Parts of this area can be considered desert because so little rain falls. There is some debate over who first settled Madagascar. Some anthropologists believe it was first settled 2,000 years ago by Indonesians, not black Africans, and that mainland Africans did not arrive until a later date. Others suggest that the people of Madagascar descended from Indonesians and Africans who had mixed before their arrival on the isolated island. Regardless, most experts agree that Madagascar's inhabitants arrived relatively recently (there is no evidence of a stone age in Madagascar) and that subsequent migrations have brought other groups (like Arabs and Indians) into the mix. The mixed origins of the Malagasy (the name for the people of Madagascar) has produced an interesting set of cultures that draws from Southeast Asia, India, Africa, and the Middle East. The Indonesian component of Malagasy culture is very evident in the language -- which is closely related to a dialect in Borneo, an island in Indonesia -- as well as systems of beliefs and the rice-based diet. Rice is the most popular food in Madagascar and many Malagasy eat rice at every meal. Beef is also a popular, although expensive, food. The zebu cattle in Madagascar have their origins in India, but reflect the African cultural influence on the people of Madagascar. Within the country, people's physical appearance, religious practices, and traditions are highly regional -- the strongest bond between the Malagasy is sharing a common language. Today there are more than 20 ethnic groups in Madagascar from the Indonesian-looking Merina people of the highlands to the African-looking Sakalava in western coastal areas to the Arabic Antaimoro on the eastern coast. Madagascar is a land of extraordinary cultural richness. It's a place where ancestors are as much a part of the present day as they are of the past; where in many areas taboo and tradition takes precedence over the law; and western-style religion is freely mixed with beliefs in sorcery and unparalleled funerary customs. Today Madagascar is home to around 18 million people. Madagascar was first settled by humans about 2000 years ago. Madagascar's settlers were either Indonesians or people of mixed Indonesian/African descent. Arab traders arrived on the scene around 800-900 A.D. when merchants begin trading along the northern coast. In 1975, Didier Ratsiraka took control of the country. He ruled Madagascar as a dictator until he was overthrown in 1991 amid an economic collapse. He regained the presidency shortly thereafter and ruled until losing a contested election in 2001. The new president, Marc Ravalomanana, promised to bring democracy to the country. Having gotten his start selling yogurt on the streets from the back of his bicycle, Ravalomanana built a business empire and became Madagascar's richest man. As of 2005, he is still president and the economy continues to improve. Madagascar has some of the highest biodiversity on the planet. Of roughly 200,000 known species found on Madagascar, about 150,000 are endemic -- meaning they exist nowhere else. Unique to the island are more than 50 types of lemurs, 99% of its frog species, and 36 genera of birds. Madgascar houses 100% of the world's lemurs, half of its chameleon species, and 6% of its frogs (though none of its toads). Some species found in Madagascar have their closest relatives not in Africa but in the South Pacific and South America. The aye-aye is one of the strangest creatures in the world. This nocturnal and reclusive lemur looks as if it had been assembled from a variety of animals. The aye-aye resembles a large house cat but with the face of a ferret or weasel, bat-like ears capable of rotating independently, teeth that grow constantly like those of a rodent, piercing green eyes, and black hands featuring a bony middle finger reminiscent of a dead twig. The aye-aye uses this finger for locating insect larvae that lurk deep inside tree bark, seeds, and fruit. As it climbs along a tree branch, the aye-aye taps the bark while listening for cavities in the wood. When it hears something potentially appetizing beneath the surface, the aye-aye gnaws away at the wood in search of its prize. Today the aye-aye is highly threatened by habitat loss and hunting. In some areas local people believe the aye-aye brings bad luck and will kill the animal whenever they encounter it. The indri is the largest living lemur. Black and white in color, the indri is famous for its eerie wail that sounds a bit like the song of a humpback whale. The indri feeds on fruit and leaves in the canopy of the rainforests of eastern Madagascar. Today the indri is endangered due to habitat loss. Verreaux's sifaka lives in the dry forests of western and southern Madagascar where it feeds on leaves, fruit, and flowers. Sifakas are quite vocal with a variety of calls, but they are best known as "dancing lemurs" for their mode of locomotion when they cross open ground. 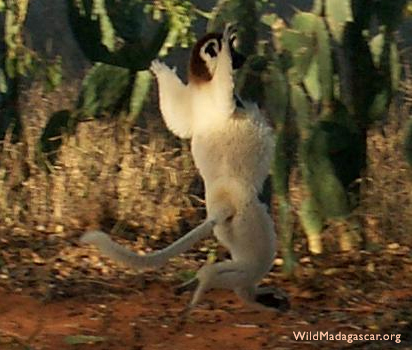 Sifakas do not move about on all fours -- instead they sashay on their hind legs while holding their arms aloft. The ring-tailed lemur is the best known of lemurs. Ring-tails live in the dry forests of southern and western Madagascar where they feed on fruit, flowers, leaves, and bark. Mouse lemurs are tiny primates found widely in Madagascar. Nocturnal and feeding on insects, small vertebrates, fruit, and flowers, mouse lemurs are known for their chirping vocalizations and frenetic activity. The pygmy mouse lemur (Microcebus myoxinus) may be the world's smallest primate. Mouse lemurs are being studied for the possible treatment for Alzheimer's disease. The fossa is a carnivore that is related to the mongoose and looks like a cross between a puma and a dog. Fossas are nocturnal creatures that hunt almost any animal including insects, reptiles, rodents, and lemurs. 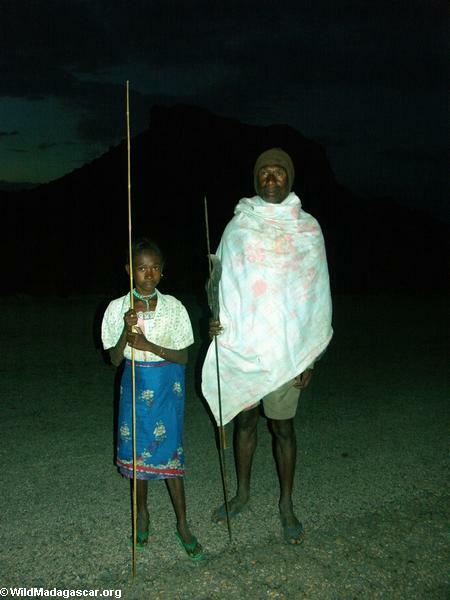 They also prey on chickens in and around Malagasy villages and are hunted by local people as vermin. Fossa are active both in trees and on the ground and are excellent climbers. Tenrecs are unusual insectivores that have radiated into ecological niches filled in other lands by hedgehogs, mice, shrews, opossums, and even otters. While some tenrecs are found in Africa, they are most diverse in Madagascar which has around 30 species. Madagascar is home to 258 bird species of which 115 are found nowhere else in the world. Madagascar once had giant land birds, the largest of which weighed over 1,100 pounds (500 kg) and stood ten feet (3m) tall. Elephant birds (Aepyornis) were driven to extinction in recent history by human hunting, introduced species, and habitat loss. Madagascar is thought to have more than 300 species of frogs, 99% of which are endemic. Frogs are the only amphibians found in Madagascar -- there are no toads, salamanders, or newts. The Tomato frog releases a sticky, glue-like secretion that protects it against colubrid snakes, cats, and dogs. This secreted substance can produce an allergic reaction in humans as well. Mantella are among the most popular of Malagasy frogs in the pet trade. These strikingly beautiful frogs fill a similar ecological niche to the poison-dart frogs of South America in that both use bright color to advertise their toxic skin secretions to predators. Madagascar is home to more than 300 species of reptiles of which over 90% are endemic. Madagascar's reptile fauna includes lizards, snakes, turtles & tortoises, and crocodiles. Madagascar's reptiles are as unusual as they are unique. The island lacks pythons, which are found in nearby Africa and throughout Asia, along with front-fanged venomous snakes. Equally strange, Madagascar's iguanid lizards and boas have their closest relatives in South America. The uniqueness of the island's reptiles has resulted in widespread collecting for the exotic pet trade. Some species of chameleons, geckos, and tortoises are threatened due to over-collection. Madagascar is home to more than 80 species of snakes, none of which are overtly dangerous to humans. An unknown number of species of invertebrates are found in Madagascar, which has some of the richest insect biodiversity on the planet. Deforestation in Madagascar is largely the result of three activities: slash-and-burn agriculture, logging, and the production of fuelwood and charcoal for cooking fires. Slash-and-burn agriculture, known locally as tavy is an important part of Malagasy culture and the Malagasy economy. Tavy is mostly used for converting tropical rainforests in Madagascar into rice fields. Typically an acre or two of forest is cut, burned, and then planted with rice. After a year or two of production the field is left unused for 4-6 years before the process is repeated. After 2-3 such cycles the soil is exhausted of nutrients and the land is likely colonized by scrub vegetation or grass. On slopes, the new vegetation is often insufficient to anchor soils, making erosion and landslides a problem. Tavy is the most expedient way for many Malagasy to provide for their families, and among people whose day- to-day subsistence is in question there is little concern for the long-term consequences of their actions. From their perspective, as long as there is more forest land freely available for clearing, you might as well use the land before a neighbor does. Tavy for rice also has spiritual and cultural ties that transcend the economic and nutritional value of rice as a crop. Logging for timber is especially a problem in the rainforests of eastern Madagascar, particularly on the Masoala peninsula. The high value for Malagasy hardwoods (mostly ebony and rosewood which may fetch $2,000 a ton in international markets) makes illegal logging a significant problem in some protected areas. 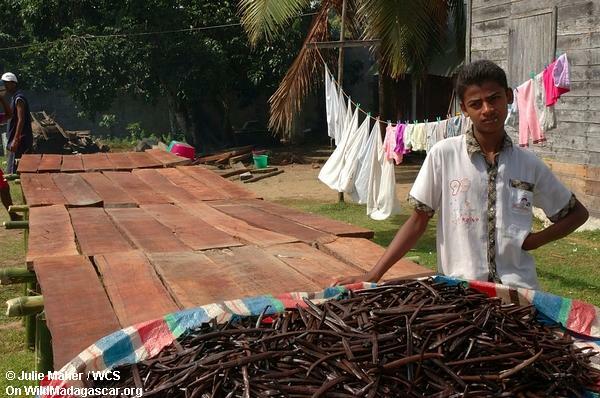 The endemic spiny forests of Madagascar are being cut at an alarming rate for charcoal production. In eking out a living by selling little piles of charcoal along roads in southwestern Madagascar, local people turn towards the nearest plant source which in this case is often the magnificent Alluaudia tree. Every year as much as a third of Madagascar burns. Fires set for land-clearing and pasture land spread into adjacent wildlands causing damage to the island's unique ecosystems. With its rivers running blood red and staining the surrounding Indian Ocean, Astronauts have remarked that it looks like Madagascar is bleeding to death. This insightful observation highlights one of Madagascar's greatest environmental problems -- soil erosion. 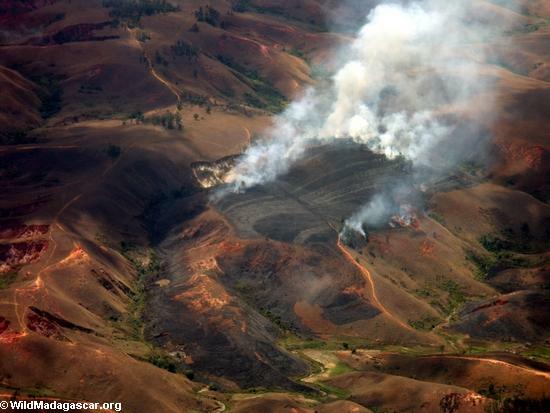 Deforestation of Madagascar's central highlands has resulted in widespread soil erosion. For Madagascar, a country that relies on agricultural production for the foundation of its economy, the loss of this soil is especially costly. Madagascar's native species have been aggressively hunted and collected by people desperately seeking to provide for their families. While it has been illegal to kill or keep lemurs as pets since 1964, today lemurs are hunted as bushmeat in areas where they are not protected by local taboos called fady. Tenrecs and carnivores are also widely hunted as a source of protein. Reptiles and amphibians are enthusiastically collected for the international pet trade. 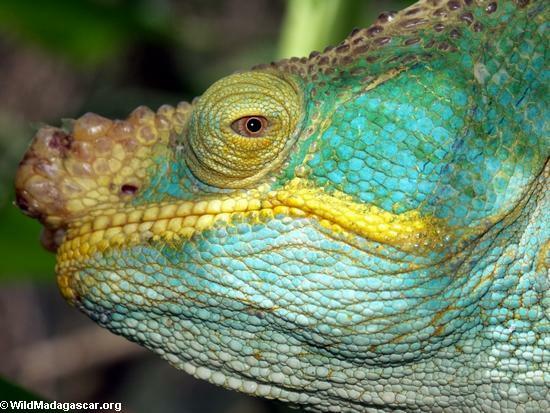 Chameleons, geckos, snakes, and tortoises are the most targeted. The waters around Madagascar serve as a rich fishery and are an important source of income for villagers. Unfortunately fishing is poorly supervised and regulated. Foreign fishing boats encroach on fishing areas leaving locals and the marine fauna with the short end of the stick. Sharks, sea cucumbers, and lobsters may be harvested at increasingly unsustainable rates. True or false. Madagascar is a little larger than the state of California. True or false. The first known European to see Madagascar was Portuguese sea captain who was blown off course on the way to India. Madagascar is famous for its _____________, a spice that comes from an orchid and is used to flavor ice cream. ____________ is the most popular food in Madagascar. The people of Madagascar speak a language that came from __________________. Today Madagascar is a ________________, meaning all people have the right to vote. The fossa is a _____________ in that it only eats other animals. Ring tailed-lemurs are herbivores in that they primarily eat fruit, leaves, and flowers. The largest lemur is the _____________. 75% of Madagascar's animals are ______________, meaning they are found no place else on Earth. True or false. Madagascar doesn't have any snakes that are dangerous to humans. True or false. Lemurs are also found on mainland Africa. True or false. Geckos can change colors to reflect their emotions. True or false. The tomato frog releases a toxic substance to protect it from predators. Madagascar was once home to giant elephant birds but they went _________________. Therefore elephant birds are no longer found in Madagascar. Madagascar's forests are disappearing due to _____________________. Many of Madagascar's reptiles and amphibians are being collected for the ___________ trade. Soil __________ hurts the economy of Madagascar but reducing agricultural yields. True or false. Bushmeat refers to the hunting of wild animals for food. True or false. Madagascar has one of the best park systems in Africa. True or false. Ecotourism can help protect Madagascar's environment while providing jobs for local people.